Not only am I the kind of hopeless nerd who spends a lot of time in the terminal, I’m also the kind who, in the face of countless elegant pieces of task management software, decides to write my own. Today I released the newest version of my three-year-old todo.txt command line interface–a 600-line bash script that lets me add to, check off, and slice and dice my todo.txt file without a full-on editor. To download it and try it out, or just see a screencast of it in action, check out my full writeup at Lifehacker this morning: Todo.txt CLI Manages Your Tasks from the Command Line. Does Cygwin have any significant advantages over powershell? I should probably get to know Cygwin even if it doesn’t, just to get familiar with the way things are done in a linux’y environment. My geek cred is sorely lacking in this area. I use Cygwin or the packaged on Mac Terminal with my todo.sh script. At first there was an error with the todo.sh 1.7 and Mac’s Terminal that involved -e’s appearing in my list results, but now with 2.0, it is entirely fixed. I like to run the Perl script on a nearby machine and use iChat or any other AIM client. This looks fantastic, but I’m running into trouble getting it working. I don’t keep anything in /home/tbramble/ unless it’s a directory or a .hidden file, so I have todo.sh and todo.cfg under a directory I use for executables not installed by the package manager, /home/tbramble/Bin/(todo/, in this case). Trevor I screwed up the -d parameter in 2.0–try 2.0.1 which has the fix. So sorry. Working splendidly now. Thanks, Gina! For anyone still following this thread, I released version 2.1, which is available for download here. On a side note.. 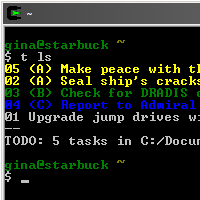 Looking at the screenshot, it appears that you use windows command prompt for cygwin. You might want to switch to rxvt than to windows command prompt.. Its feels so refreshing to work inside the RXVT terminal than the grumpy command prompt of windows. Hope you enjoy the switch as much I did. This script has an error. When you delete items, their lines don’t go away. Look! The folder exists and I even gave gave it full read-write permissions, any ideas?